Good news, the Mexican yellow caterpillar from last week’s Bug of the Week made it to adulthood. I was able to find the chrysalis, which was empty because the butterfly had emerged. 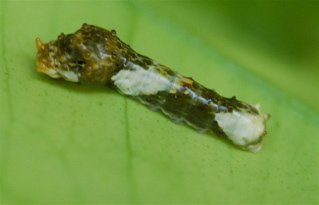 The chrysalis is the pale yellow object on the side of the twig. Way to go Mexican yellow! This week I spotted evidence of another caterpillar on our grapefruit tree. When you see a leaf with ratty edges like this, it can only be a few insects. I was pretty sure I knew which one. Sure enough, when I tipped the leaf over I found it. Which of the pictures below is the insect I found? I’ll tell you next week what it is and how it is doing.